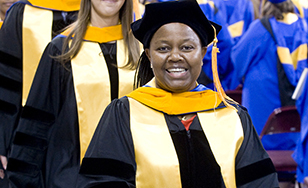 Growing up in Kenya, Judith Mutie saw firsthand the importance of preventive medicine. She was inspired to go into healthcare to become a voice for those who aren't able to speak up for themselves. "It has been my drive to advocate and to serve the underserved communities," Mutie said. That drive motivated Mutie to move to the United States for her education and pursue her nursing degree. She got a job as a nurse in the orthopedic unit at Fairview Southdale Hospital in Edina, but wanted to keep progressing in her education while working. She chose the Doctor of Nursing Practice program at The College of St. Scholastica, and she graduated in May. "I wanted to do my DNP to be able to make a difference in people's lives," Mutie said. "Growing up in Kenya you see all of these health and health care disparities - children dying of preventable childhood diseases and people dying from cancer that could have been prevented by early screening. I figured that when I get my DNP, I'll be in a position to make health care policies, close health and health care gaps in the underserved populations, educate people about health and diseases and also be an advocate for people who cannot voice their concerns. My main goal is to improve health care outcomes in the underserved populations." That goal influenced Mutie's choice to do her final class project about colorectal screening rates in the inner city. She chose to partner with a Minneapolis clinic that serves lower-income Twin Cities residents, including large populations of immigrants. "I wanted to do a project where I could make a difference, and have an impact," Mutie said. She worked with the clinic to develop a clinical workflow process that builds in prompts for staff members to ask their patients about colorectal screening if they meet certain criteria about age, health, etc. The computer prompts "keep flagging the medical staff until the screening and followup are done," Mutie explained. Thanks to her research and the implementation of her project, the clinic also won a $50,000 grant from the UCare Foundation to purchase medical equipment needed to perform screenings. At last check, the screening rate at the clinic had increased from 26 to 31 percent, and the clinic wants Mutie to implement her plan at its three other locations. Seeing the results of her work has been gratifying, Mutie said. "That's one of the reasons I came to St. Scholastica, because of your mission goals to have ‘Saints' everywhere," she said with a laugh, referencing the College's tagline, "The world needs more Saints." "If I can make a difference in somebody's life, if I can make an impact in a community, city or country, I'm happy. That's why I love nursing." She said she's grateful that the program has helped her get to the next stage of her nursing career. "The teachers have been wonderful. I would recommend St. Scholastica to anybody." Sara McCumber, an assistant professor in the graduate nursing department, said she was impressed with Mutie and her initiative. "I think it was really incredible that she sought out an opportunity to work with an agency that served immigrants," McCumber said. "The project is going to make a big impact because there wasn't a very well-defined clinical workflow process in the agency. Colorectal cancer has a high death rate, but it can be prevented by early screening." Eventually, Mutie says, she'd love to travel the world and help improve preventive care in countries with underserved populations, perhaps even Kenya. "Developing and implementing initiatives that lead to eliminating health and healthcare disparities in the underserved populations will be a key focus in my future career," she said.